—Reduce transport of germs from room to room/patient to patient! 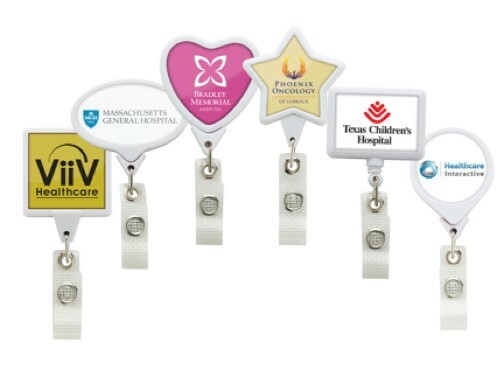 —Repel bacteria & viruses that cannot stick to these Retractors! —The Polydome resin is also anti-microbial! The anti-microbial chemicals are imbedded in the plastic to make sure that the effectiveness never expires or fades away! Human Resource departments are the buyers for this product and you should be calling on them today. Do you work for a hospital? Do you have clients that work in hospitals? This is a great product for anyone that uses badge holders. Stay safe and try our retractors. To facilitate safety in a world full of biological dangers, experts in the field of polymers are beginning to embrace antimicrobial plastic extrusions. Yes, humanity needs these. Taking the fact that it is impossible to do away with plastics, the most logical thing to do seems to be to look into the best ways they can be produced so as to enhance safety. The inherent characteristics of antimicrobial plastic make it to be stain resistant. Also, it will not be discolored easily. •	Antimicrobial benefits of these items cannot be washed away. This is because of the fact that they have been deeply embedded inside the products by using intricate manufacturing processes.